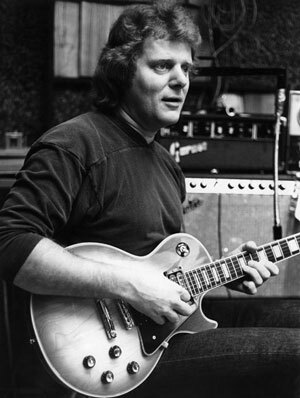 Forever Young, freshly out on the British Ace label, is legendary session guitarist Reggie Young’s debut album under his own name. You read right: the brilliant fretsman whose liquid licks graced classics by Eddie Bond, the Bill Black Combo, James Carr, Joe Tex, King Curtis, Neil Diamond, Dusty Springfield, Elvis Presley, B.J. Thomas, Dobie Gray, and Billy Swan— that’s just for starters–never released an album of his own before. The closest he came was in 2008, when Reggie and his cellist wife Jenny Lynn issued the inspirational CD Be Still. But as far as secular material goes, Forever Young represents his very first. 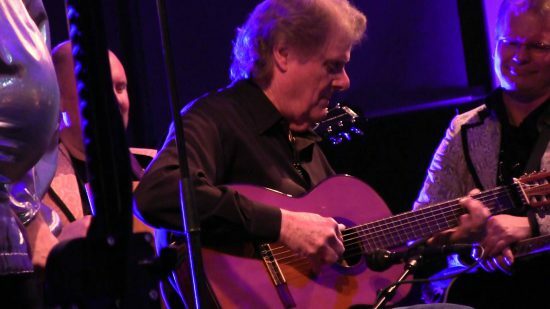 The album’s seven instrumental selections underscore what an inventive and immaculate guitarist Young is and has always been. The basic tracks were recorded in Alabama with a band that included bassist David Hood, keyboardist Clayton Ivey, and saxist Jim Horn. So it was back to Memphis, where Reggie backed another obscure vocalist named Barney Burcham on his ‘55 single “Much Too Young For Love” for Lester Bihari’s Meteor label. His first real break came when he joined local singer Eddie Bond’s band. “Eddie had just got out of the Navy, and I was in a band in Memphis,” says Young. “We needed a singer for the band the first time I saw him. Then he started his own. He called it Eddie Bond and the Stompers, and we played local clubs and stuff around town. Even if Bond wasn’t pacted to Sun like Cash, Perkins, Smith, and Orbison, Reggie’s blistering solos on his regional seller “Rockin’ Daddy” (a cover of Sonny Fisher’s Starday single that had Joey Long on lead guitar) as well as his encores “Boppin’ Bonnie,” “Flip, Flop Mama,” and “Slip, Slip, Slippin’-In” helped catapult Eddie into the major leagues of rockabilly quality-wise, if not in the sales department. Young’s next stop as a sideman was another country-bred singer who was enjoying some rockabilly success, Johnny Horton. The success of Sun Records had spawned the launch of quite a few more Memphis labels, including Hi Records. One of Hi’s early recruits was Elvis Presley’s former bass player, Bill Black, who had quit Presley over low pay. Unlike Elvis’ longtime guitarist Scotty Moore, Black never went back on Elvis’ payroll. “When I was working with Horton, my draft board called me. They had the draft back then,” says Reggie. “She called and said, ‘Looks like you’re going to be in the next draft.’ I said, ‘Oh, okay.’ I remember playing a New Year’s show in Shreveport when it turned 1959. So I came back to Memphis. Well, I didn’t get on that draft. A lot of people joined, and they kept pushing me in the back. “I had known Bill fairly well, him and Scotty. Bill asked me, he was working at Hi’s studio. He said, ‘Would you like to join us at Hi? We’re backing up some people.’ They’d written some stuff for Hi’s studio, and this guy come to town once a month. Ed Kissack was his name, and he would come down to listen to what we recorded. If it was something that he liked, then they would release it on London Records. Hi Records was distributed by London Records. And I said, ‘Yeah, I’d be glad to do that!’ Because I was just waiting around to get drafted. “We cut this instrumental called ‘Smokie – Part 1’ and ‘Part 2.’ Back then they had two parts sometimes in instrumentals. Anyway, Ed Kissack from London Records came in, and he heard that. He said, ‘What is this?’ So I said, ‘It’s something we’re just doing.’ He liked it, and he took it back to New York and they released it. It became a hit. “When it went Top Ten, then I got drafted. So I went to Ethiopia for almost two years. I remember when I got out, I went back with Bill Black. And we did that for maybe a year or so. Then I went back to Hi Records. I went back as a studio musician with Hi Records and Bill Black, Willie Mitchell, Ace Cannon, a whole bunch of people going on back then. Anyway, we did that for quite a while, and that was good.” Reggie missed out being on Black’s immediate followup hit “White Silver Sands” during his nearly two year-stint in Ethiopia (where he became a top-level cryptographer), but he played extensively in the studio with all three of those Memphis bandleaders at Hi upon his return as the label became known for its hit instrumentals. Although his name still adorned his longtime combo, Black exited his Combo shortly before they embarked on a gala tour as one of the opening acts on the Beatles’ 1964 jaunt across America (Black would die of a brain tumor the next year). Young was the only original member still in the Combo when they hit the road in the company of not only the Fab Four, but the Righteous Brothers, the Exciters, Jackie DeShannon, and New Orleans’ own Clarence “Frogman” Henry. “We got a call. 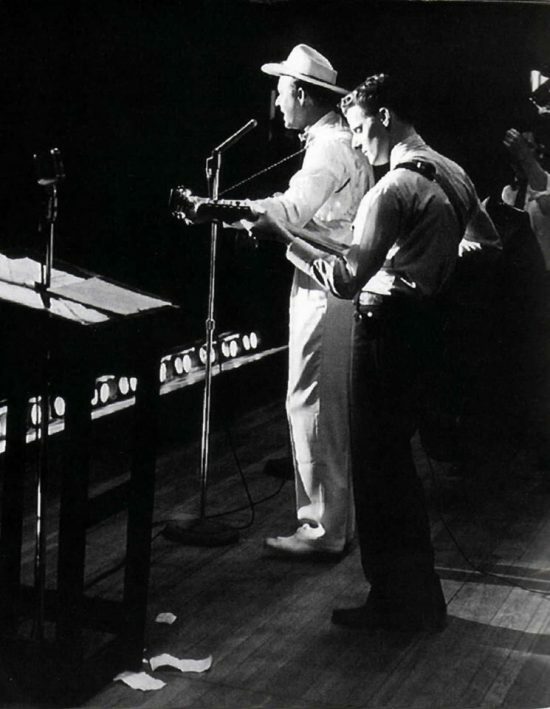 They were requesting that we would be their opening act for the 1964 tour that they were doing of America,” says Young. “Beatlemania was incredible, and it was insane. We went on first, and we backed up other artists. But when we first started, the disc jockeys would come out onstage and say, ‘Are you all here to see Ringo?’ And the crowd would just go nuts. It didn’t take long for Reggie to play on his first hit at American. It came on the Gentrys’ frat rock recasting of a soul single by the Avantis called “Keep On Dancing,” the Gentrys’ version becoming a pop smash on the MGM logo in the autumn of 1965. Soon American’s killer studio band was in place; Tommy Cogbill was as tough a bassist as existed in Memphis. “He was the monster! I don’t know of anybody even today that’s any better than Tommy,” says Reggie. “Bobby Emmons and I worked together over at Hi Records, and when I quit and got with Moman, I talked him into quitting too. He came over to Chips. The first band was me and Tommy and Bobby Emmons and (drummer) Gene Chrisman. That’s a supreme understatement. Early on, American was especially strong in the soul department. 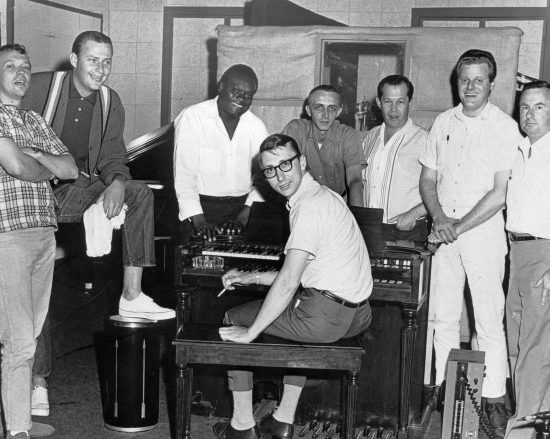 Pensacola, Florida producer Papa Don Schroeder brought two of his top acts into American: Oscar Toney, Jr., who remade the Impressions’ “For Your Precious Love,” and James & Bobby Purify, who revived the Five Du-Tones’ “Shake A Tail Feather.” Both American-cut singles were hits on the Bell imprint during the spring of ‘67. “Jerry Wexler with Atlantic Records in New York brought him down,” says Young. “It just fit so good with our band. Bobby Womack was the guitar player. He came down also. It was some really funky music.” Young and Womack found immediate common ground on their axes behind the Wicked Pickett. Another notable 1967 visitor from Atlantic’s voluminous roster was New York sax blaster King Curtis. “He’s the best one I’ve ever worked with. He was really, really good,” says Young of Curtis’ diamond-hard blowing. “He was from Texas. He could play sax in a lot of hillbilly chords, like in the key of E and the key of A, instead of all the hard flat chords and stuff.” Inspiration for King’s ‘67 smash “Memphis Soul Stew” arrived in a flash. “Next to the studio, there was a restaurant, the Ranch House. We were recording King, and we all went over there, took a break and went over there to eat lunch. We were sitting around the table, and King picked up a menu. And as a joke, he was just reading. He said, ‘Hmmm—today’s special is Memphis Soul Stew!’ He said, ‘We make so much of this stuff, we’re gonna tell you what we put in it. We got fatback drums, a pound-and-a-half of organ.’ He was just making it up. When he got to me, then we sort of looked at each other. All of us did. We just got up, we didn’t even order lunch. We just got up and went in the studio and cut ‘Memphis Soul Stew’ that quick! The following year, it was British chanteuse Dusty Springfield’s turn to hunker down at American to cut her classic Atlantic set Dusty in Memphis, featuring her breathtaking treatment of John Hurley and Ronnie Wilkins’ “Son-Of-A Preacher Man.” “I was listening to that the other day, and it still sounds good,” says Reggie. “Dusty Springfield was really good. She really sang. Texas singer B.J. Thomas did some of his best work for Florence Greenberg’s Scepter Records at American. “We did a lot of stuff with him,” says Reggie. “Jerry Wexler sent this old electric sitar down from New York. It kind of hung around the studio for awhile. I was playing that intro to ‘Hooked On A Feeling,’ and Chips or somebody said, ‘Hey, why don’t you pick that old sitar up and play it on there? It’d be different.’ So I picked it up and I started playing like Middle East music or something. It turned out to be the intro and the solo and the ending and all that stuff. Yeah, that was a good song.” The Moman production was a 1968 smash for Thomas. 1969 was a big year for superstars to drop by American in search of their next hit. Brooklyn-born Neil Diamond turned out to be a good fit with the Memphis Boys. “Neil came in, and we did about three songs with him,” says Reggie. “So we started putting our equipment up. Tommy Cogbill produced it. Tommy said, ‘You got anything else?’ He said, ‘I’ve got this one song I’m working on. It’s not finished yet.’ He started playing ‘Sweet Caroline.’ Well, I took my guitar back out of the case, because I knew we were going to cut that. And then we did. Right after he sang it, it was finished. But that was a big record. Still is. “So he came in, but they had all of his songs picked from Hill and Range Publishing in Nashville. He was playing the little acetates, the little records of the songs he was going to do. And the first one he played, he looked at me and he said, ‘You like that?’ And I said, ‘No, not really.’ He asked Bobby Wood, the piano player, ‘What do you think? You like it?’ And Bobby said, ‘Man, that is awful!’ It was mostly movie songs, you know. I forget who played it, I think Moman played ‘Suspicious Minds.’ We had cut that on Mark James, the writer, and it was out on Scepter Records. So Elvis, he liked that. He really liked that. And he hadn’t had a hit in eight years, I think, and he was really looking forward to getting a hit. He heard that song, and he wanted to cut it. “Right after that, the guy (from Hill and Range) came into the control room and told Moman, ‘Hey, if he cuts any outside material other than what we brought, we’re gonna have to have publishing on it.’ That didn’t set too well with Moman. So Moman said, ‘Well, I’ll tell you what. We have a reputation for cutting these records. If you don’t want to do that, get Elvis and all this entourage he came with, and get out of here!’ Anyway, that got back to Elvis. 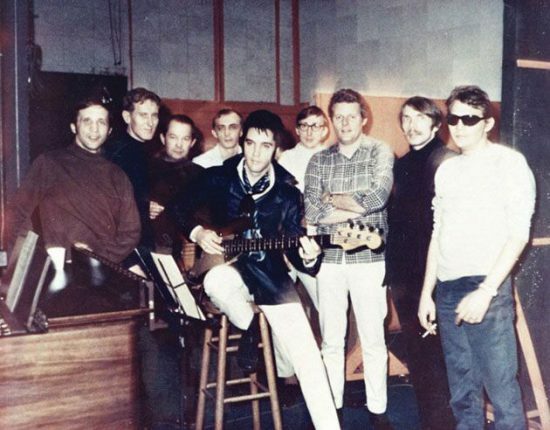 Elvis made all of them leave so it was just us, the band, five of us, and Elvis and Moman and Felton Jarvis. And we cut thirty-something sides, I think. What we cut was nothing that he brought in. Just as quickly as American rocketed to the top in 1967 and remained in orbit for the next five years, the studio fell to earth in a hurry over the course of 1972. 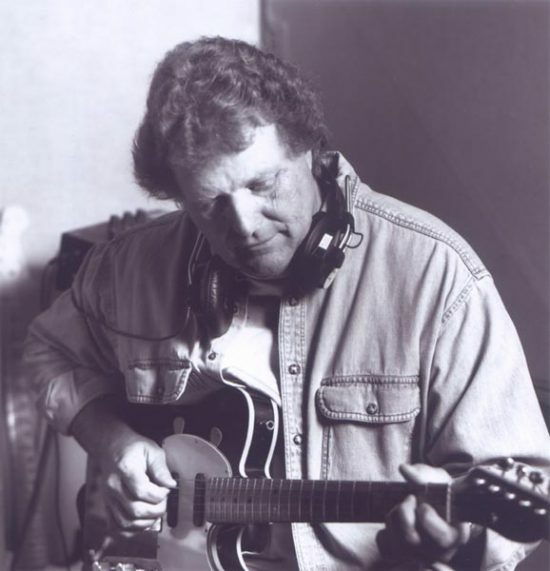 Danny O’Keefe’s “Good Time Charlie’s Got The Blues” was the last significant American-cut hit that autumn. By then Moman and his house band had already resettled in Atlanta. “We were sitting around talking a few evenings, and it’d kind of slowed down a little bit. Moman thought we weren’t getting the credit that we deserved in Memphis. They were promoting everything else but American, because we weren’t just an R&B studio. We were pop music, and R&B. We did it all,” says Young. “He said, ‘What we ought to do is move to Atlanta, move our whole organization to Atlanta.’ ‘Oh, yeah!’ we all said. I wasn’t thinking he was serious, but he was. So we packed up and went to Atlanta. We didn’t do much in Atlanta. I lasted for about a month or so, and I quit. And I came back here to Nashville, and I’ve been here ever since.” That fall, Moman also relocated to Music City. One of the Nashville studios where Reggie regularly free-lanced was Quadrafonic, owned by established local sessioneers Norbert Putnam and David Briggs (formerly part of Rick Hall’s first Muscle Shoals session band at FAME Studios). That’s where Young dreamed up the guitar lines that elevated Dobie Gray’s haunting “Drift Away,” a 1973 million-seller written and produced by Mentor Williams, to profound heights. In 1974, Young reunited with bassist Leech at co-producer Chip Young’s recording studio in Murfreesboro, Tennessee to wax “I Can Help” by its composer Billy Swan. The singer had previously written “Lover Please” when he was in a Missouri band called Mirt Mirly and the Rhythm Steppers (it was cut by Dennis Turner for Bill Black’s Louis label and covered by R&B singer Clyde McPhatter, whose ‘62 rendition was a smash on Mercury). Reggie’s cascading solo on “I Can Help” was a major factor in its pop chart-topping status. Young spent countless hours in various Nashville studios making countless singers sound their best, his creativity somehow never flagging. “I didn’t really think anything about it,” he says. “You try not to repeat yourself. The song dictates a lot of what you play. 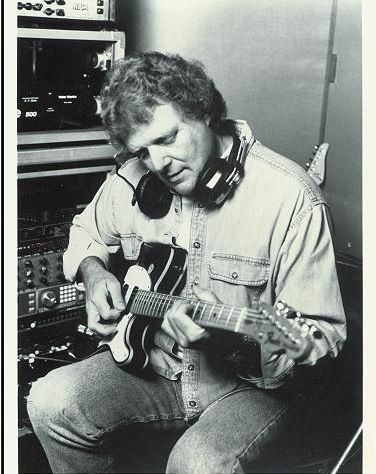 So I was very lucky all these years.” But in 1990, Reggie hit the road for the first time in ages as a special presence in the band of the Highwaymen, a country supergroup that was like a living, breathing Mount Rushmore with Johnny Cash, Willie Nelson, Waylon Jennings, and Kris Kristofferson. .
“Oh, I loved that as much as I did anything,” says Reggie. “We were all old friends, and I did that for five years—touring with them, and then also doing session work when I’d get back in town. I’d go out for 30 days in the spring and 30 days in the fall. And the rest of the time, it was studio time. But we had a great time. When we were in buses, each of them had a bus. Willie had his bus, Kris had his bus. And Waylon, Cash, they all each had a bus. The crew had a bus, and then the band had a bus. When we were going down the Interstate, we looked like the Ringling Brothers Circus! Reggie’s studio days are behind him now. “I’ve kind of taken myself out of that loop,” he says. “I do things here at home, but as far as getting up, getting out of bed and going to the studio up in Nashville and lugging all my junk around, I don’t do that anymore.” What he will be doing is talking about his spectacular career at the Stomp. 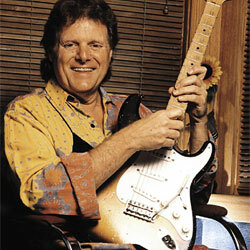 Come hear what this legendary guitar wizard has to say!